I noticed potential for cinematic lighting the last couple times I visited the fountains at Grand Park in Downtown LA. Bare sunlight, shimmering reflections and droplets in motion made me want to play with my camera (and the undrinkable water). When I see a fountain, the thought of wading in turns into an urge and then melts away into a broken dream since we all know it's socially unacceptable to jump into public fountains without being yelled at by a security guard. To avoid all the incident report paperwork for the deviants who succumb to their urges, the city of Los Angeles made a genius move with the fountains at Grand Park. 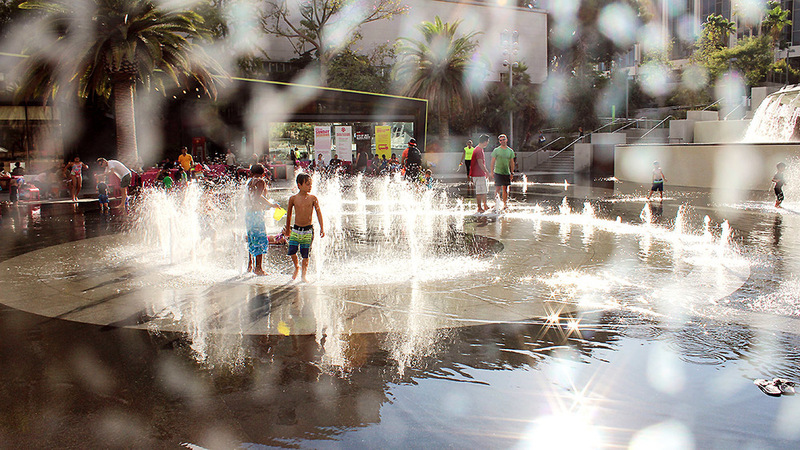 Not only is it ok to play in the fountains, we are invited to pack our swim-suited kids and run around. Close-up of the ever-tempting fountain. Swimsuits not required, but the smart kids wear them. I like this place a lot. When it's 97 degrees out and you live in the SGV, open accessible water fountains are a lifesaver. My kid can run wild. I can play with my camera. It's free. There's a Starbucks within 50 feet. The restrooms aren't scary. I can pretend I have to chase after my kid, retain my dignity and secretly enjoy the fountains too. The floor spouts keep my fountain-jumping urges at bay. Grand Park has it all...I will be back! My daughter's smile says it all.